How a Personal Injury Case Works in Illinois | Hupy and Abraham, S.C. Many people who are hurt find themselves in overwhelming and confusing situations. As you manage the often complex series of medical appointments and procedures that you need to get well, you are also expected to navigate the legal system to protect your financial recovery. It is seldom as easy as it looks on TV. As you move ahead with your recovery, it is important to know how a case works and how an experienced personal injury lawyer can help you get the recovery that you deserve. Before you take any action, you should consider whether or not you have claim that could result in a legal recovery. The first step in determining whether you may have a legal recovery is to determine if there is a legal cause of action for your lawsuit. In other words, you want to determine if you could have a personal injury case. Assuming that there is a legal cause of action, such as negligence, then you will also want to consider whether your own actions contributed to your injury. The Illinois Contributory Negligence Law will allow you to recover damages if you were not primarily responsible for the accident. If you were responsible for less than 51% of the accident, then you may make a legal recovery, but your recovery will be reduced by the percentage of fault attributable to you. If, after considering these factors with an experienced personal injury lawyer, you determine that you want to move forward with a lawsuit then you should learn more about what to do next. How long you have to file a case. 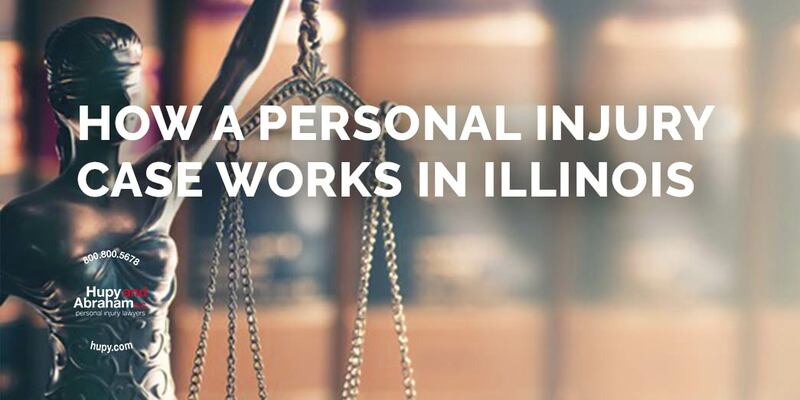 Illinois law typically provides you with two years to file a personal injury case. However, that time frame may be longer or shorter depending on the facts of your case. Whether you have legal standing to file a case. If you were the one who was hurt, if you are the parent or guardian of someone who doesn’t have standing to file their own case, or if you are the representative of the estate in a wrongful death action, then you may have the legal right, or standing, to bring a case. How to file your case. Your case begins when you file a complaint, other required documents, and the appropriate fees in an Illinois circuit court. How to choose a lawyer. Hiring an attorney is a personal process. You may want to consider your own feelings when you meet with a lawyer, information from previous clients, and an attorney’s experience. Whether you need witnesses for your case. Useful witnesses may include eyewitnesses and expert witnesses. The specific witnesses that are important vary from case to case. How to deal with insurance adjusters. Insurance adjusters have a job to do and that job is to pay you as little as possible for your recovery. Accordingly, it is important to be very cautious in speaking with insurance adjusters and to assume that anything you say, write, or sign may be used against you. Whether you will have to go to court. If your case does not settle, then you will have to go to court. However, if you have an attorney representing you, then you will know what to expect before you enter the courtroom and you will be prepared for what will happen. What to do after your personal injury action to protect your rights. As soon as possible after you are hurt, you should get medical help, you should notify the police or property owner of the incident, and you should preserve any evidence that you can protect. Mistakes you can avoid after a personal injury accident. Some common mistakes include apologizing for the incident, failing to follow through with your medical treatment plan, and talking freely with insurance adjusters. With this information, you can begin protecting your rights and getting the recovery that you deserve. You have a lot at stake in a personal injury case and every action that you take can impact your recovery. Our experienced lawyers only practice personal injury law and our personal injury lawyers can help you through this challenging time. We will answer all of your questions, we will protect your rights, and we will fight hard for the fair recovery that you deserve. Many of our potential clients worry about how much it costs to hire a personal injury lawyer. Our attorneys offer free consultations and we are paid on a contingency fee basis—meaning that we are only paid if we are successful in your claim and that we will be paid a previously agreed upon percentage of your settlement. Therefore, you have nothing to lose and much to potentially gain from working with our firm. For more information, or to schedule your free, no-obligation consultation, please contact us online or by calling us directly at 800.800.5678.